The aspiring politician stood at the microphone with a receptive crowd standing attentively before her. She launched into her speech with energy and passion, making her points and picking up steam. Then it happened--she reached for the one foolproof tool that all politicians wield at some point, a quote from a Founding Father. The crowd applauded, obviously excited by the familiar quote and the idea that they were following in the spirit of a great American thinker and leader. The only problem with this scene that has been repeated many times across the country is that Thomas Jefferson never said that, never wrote that, and quite possibly never thought it. Our aspiring politician had fallen victim to the perils of popular misattribution. You could fill a book with misquotes and misattributed quotes we hear repeated regularly today. Right now if I Google “All tyranny needs to gain a foothold is for people of good conscience to remain silent” the entire first page of results wrongly attribute it to Thomas Jefferson. 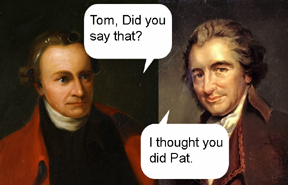 The quote and its many variants have been attributed in the past to Patrick Henry, Thomas Paine and Edmund Burke, but no record exists of the quote in any of their writings or contemporary accounts. In its most recent use, the quote was being held up as an argument against the ever expanding size and power of the government, accusing the Obama administration of infringements on the Constitution and Bill of Rights. A short while ago other politicians and citizens used it in protest against the Bush administration regarding the Patriot Act and their infringements on the Constitution and Bill of Rights. Apparently it isn’t easy for either side of this argument to see that tyranny might just exist on both sides. Who suffers for misquotes used as political attacks? We all do. 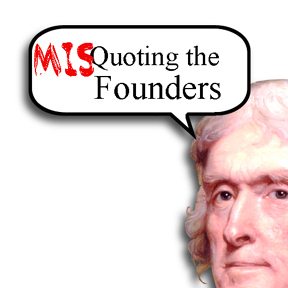 Both sides in our ongoing political debate seem to recognize the value of the Founding philosophy and wisdom of Thomas Jefferson, but when we attack with a misquote we don’t actually get that wisdom or understanding. If we take the time to read his actual words however, we find ideas that are sometimes exciting, sometimes challenging, and often empowering. I’ve included some of his actual quotes (with notation on where they can be found) below. I have chosen quotes that seem close to or relevant to the incorrect quote that kicked off our article. These quotes are guaranteed for political rallies, signs, t-shirts and even for keeping Liberty alive. "When wrongs are pressed because it is believed they will be borne, resistance becomes morality." -Thomas Jefferson to Madame de Stael, 1807. But is the spirit of the people an infallible, a permanent reliance? Is it government? Is this the kind of protection we receive in return for the rights we give up? Besides, the spirit of the times may alter, will alter. Our rulers will become corrupt, our people careless. A single zealot may commence persecutor, and better men be his victims. It can never be too often repeated, that the time for fixing every essential right on a legal basis is while our rulers are honest, and ourselves united. From the conclusion of this war we shall be going down hill. It will not then be necessary to resort every moment to the people for support. They will be forgotten, therefore, and their rights disregarded. They will forget themselves, but in the sole faculty of making money, and will never think of uniting to effect a due respect for their rights. The shackles, therefore, which shall not be knocked off at the conclusion of this war, will remain on us long, will be made heavier and heavier, till our rights shall revive or expire in a convulsion.